I'd like to know if I can use a gear train to drive a pinion, and thereby increase the torque of the rack. If so, how does the gear ratio of the gear train affect the torque of the rack relative to the gear ratio of the rack and pinion on its own? Also, and this should perhaps be another question but I'll go ahead and ask it: If I have two separate racks separated by a distance of X, connected so that when one rack moves the other moves also, and use a pinion to drive only one rack, should I expect a decrease in the torque of the secondary rack, and if so to what degree? 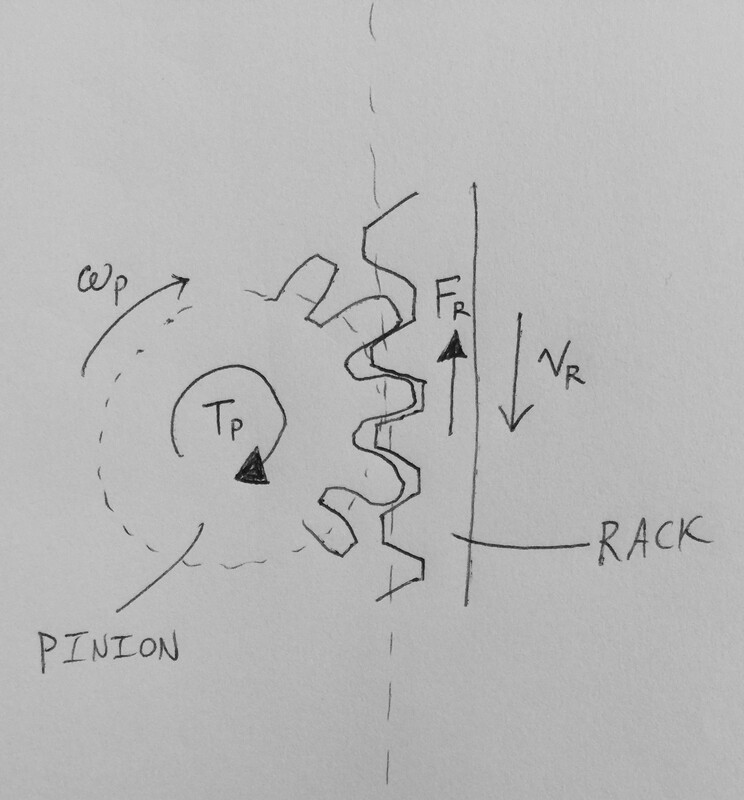 In order to help ensure I get an answer to my specific question, I'd like to state upfront that I'm aware that the gear ratio of the rack is determined by the distance the rack travels relative to each rotation of the pinion. So my question relates to whether or not the mechanical advantage created by a gear train is entirely lost if the gear train is used to drive a pinion which drives a rack, and how the torque of the rack scales when using a gear train to turn the pinion relative to the gear ratio of the rack and pinion themselves. It doesn’t really make much sense to talk about the torque of a rack for power transmission, since racks do not rotate but instead translate. Instead, it makes more sense to talk about the force of the rack. As for how this all fits in with a drive train connected to the pinion, let’s suppose the drivetrain starts with gear $i$ (which has torque $T_i$ and angular speed $\omega_i$) and ends with gear $o$ ($T_o$, $\omega_o$). Gear $o$ is connected via gearshaft to the pinion (of the rack and pinion set) ($T_o=T_P$, $\omega_o=\omega_P$). So with gear $i$ as the input to the overall system, and the rack as the output, you can see how the gear ratio $G$ of the geartrain does indeed contribute to the mechanical advantage of the pinion-rack gearset. As for the second part of your question, I’m afraid I can’t help much without seeing any sort of diagram of the configuration of the gearing. There is a direct correlation between any gear system input and output. The rack and pinion is just another gear. The gearing can be modeled as one gear against the rack if you do the math to make that gear an equivalent ratio to the track. If one gear is twice the size of the next it has a 2 to one ratio. If your rack and pinion also have a 2 to one ratio then adding the gear to the rack and pinion will result in a 4 to one ratio (forgive me if i just made stupid error in math, i haven't had coffee yet). So, if you add gears to your pinion gear you will amplify torque or speed to your rack. If you use a second rack and pinion tied to the first the and the load is shared between the two you will only see a difference due to the losses of friction and normal gear transmission losses. Not the answer you're looking for? Browse other questions tagged mechanical-engineering gears torque or ask your own question. How can I calculate final gear ratio when the drive train contains multiple gears with some reductions on the same shaft?